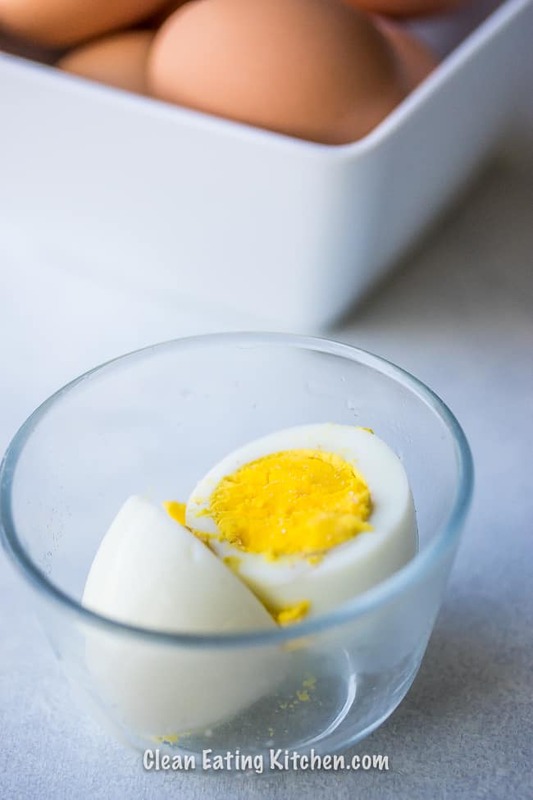 Make Instant Pot Hard Boiled Eggs in just seven minutes. Use your mini 3-quart Instant Pot pressure cooker for a half-dozen perfectly cooked eggs that peel easily and without effort. Hard-boiled eggs are just about the perfect healthy snack. They have a nice balance of protein and fat, and they’re portable and taste great. Kids love hard-boiled eggs, and adults do too. Here are some nutrition facts about eggs and what makes them so great. One egg contains about 70 calories, 6 grams of protein, and 5 grams of fat and 0.4 grams of carbs. Choline is prevalent in eggs, and choline is one of the harder to get nutrients in our modern diet. Just be sure to eat the yolk because that’s where the choline is. Dr. Axe has a great article about choline benefits and signs of deficiency. You can serve eggs in so many different forms. I personally love hard-boiled eggs, but my husband prefers scrambled or sunny-side up. 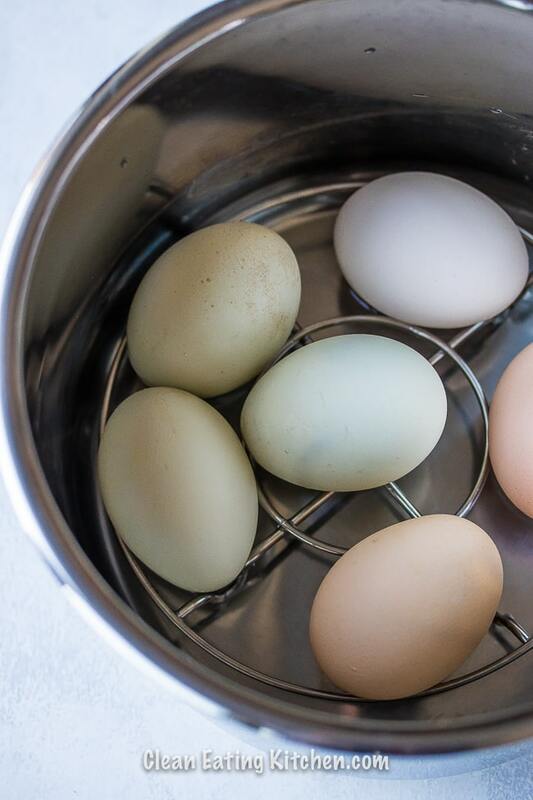 You can keep fresh eggs in the fridge for up to 30 days. That is so helpful when you’re busy and don’t have time to shop. I love my Instant Pot so much that I bought both the 3-quart and the 6-quart versions. I like to call the mini 3-quart version the “baby,” but the truth is, it is very versatile and powerful in its own right. If you’re cooking for one or two, or you want to spend less than $60 on Amazon, then the 3-quart Instant Pot has your name on it! You could certainly make hard-boiled eggs in any version of Instant Pot, but we never go through more than a half-dozen hard-boiled eggs in a week in my household. 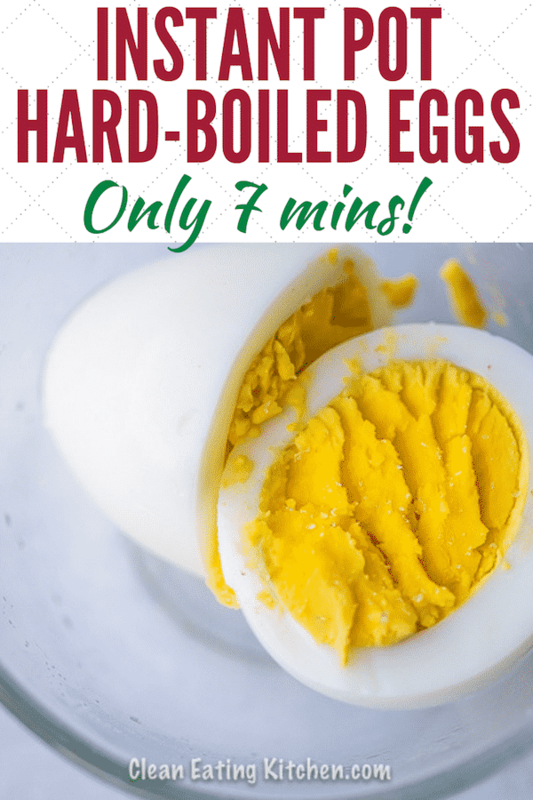 That’s why I’m sharing this guide to making a half-dozen hard-boiled eggs in your Instant Pot today. Place the trivet on the bottom of your stainless steel pot. Place the eggs on the trivet. Lock on the lid, set the valve to sealing, and set the time to 7 minutes. Once the cooking time is complete, let the pressure come down naturally for 5 minutes, and then quick-release the rest of the pressure. Transfer your eggs to an ice bath and then peel before consuming. How long can I keep hard-boiled eggs in the fridge? Hard-boiled eggs can keep up to a week in the fridge. Why do I need to buy organic and pasture-raised eggs? This is the only way you can sure that the chickens weren’t fed soy or GMO feed and that your eggs will have the highest nutrition. Can I use another brand of pressure cooker for this recipe? Yes! But, I only tested it using the Instant Pot. Get My Free Instant Pot Cheat Sheet! Place the trivet in your 3-quart or 6-quart Instant Pot pressure cooker. Place the eggs carefully on the trivet and lock on the lid. Use the arrows to adjust the time to 7 minutes. Once the cooking time is complete, you use the natural-release for five minutes and then quick-release the rest of the pressure to unlock the lid. Use tongs to place the eggs in a bowl filled with ice water to cool the eggs. Then, pour off the water and refrigerate the eggs for up to a week. When you’re ready to eat the eggs, just gently peel off the shell before consuming. 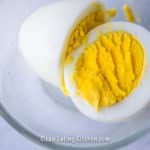 This is the easiest way I’ve found to make hard-boiled eggs. So yum! Can I put a second layer of eggs? Do you mean add another trivet on top? Yes, that works! I have got to say that I do love a boiled egg or two! They are perfect for diets and can be eaten as a snack when you are on the run. Thank you for this blog post, I really enjoy reading about clean eating. This is such a good idea. I hate waiting for my eggs to boil.